Hettich Australia announces a new range of intelligent organisers designed for secure storage of documents or valuables in desks and cabinets. 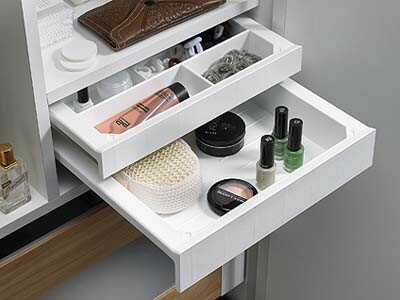 The SmarTray organiser from Hettich is a modular and compact system that is just as much at home below the desktop as it is in any cabinet. Also available in a lockable version made of steel, SmarTray is the ideal place to store valuables or confidential documents. The plastic model is perfect for items that need to be within easy reach. Some of the advantages of the SmarTray design include high quality material and finish; user-friendly features such as Push to open or self closing with Silent System; numerous design options in terms of colours and heights as well as choice of steel or plastic construction to suit different uses; and space-saving form. The housing of SmarTray Steel allows integration below the desktop or in a cabinet. Key features also include modern white or classy anthracite finish; 50mm or 75mm height with cassette; Quadro full extension runners with Silent System; and pencil tray opening out fully to accommodate large items such as notebooks. Key features include pencil tray in high quality plastic with choice of three housing colours - white, black and aluminium; 40mm or 60mm height; and Quadro partial extension runner available with Silent System or Push to open.